To coincide with the March version update, Producer Akihiko Matsui held another "Freshly Picked Vana'diel" to go over some of the new content and discuss other topics pertinent to adventuring. Below is a digest of what was discussed. Thank you for tuning in to yesterday's Freshly Picked Vana'diel. During this campaign you can obtain the Lehko Habhoka alter ego. He looks really cool in battle because of his special animations, so be sure to get it! Click here full details on Repeat Login Campaign No. 9. We're celebrating the 11th anniversary and we've added brand-new egg combination code words. 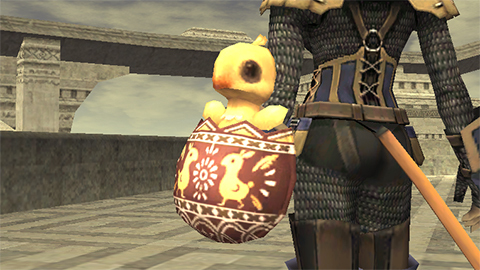 You can obtain the Hatching Shield by procuring the eggs that form the new code word. There's a hint on the topics page, "Egg Hunt 2014 - Jemimi's Mission: Impossible-Wossible" as to what the code word may be, so be sure to check it out and get your eggs! After a certain amount of time passes from the start of the event, a moogle will spawn and clue you in on the code words. If you're absolutely lost as to what the code word is, just wait for this moogle to help you out. *During the stream, the new alter egos were summoned forth and some of the new battle messages were shown off. We've made it so alter egos speak when being called forth, dismissed, and if they should fall in battle. There are also alter egos that will have special lines when paired up with other alter egos. In a future version update, we are planning to make it so alter egos inform you during specific times such as when TP has been saved up and they are ready to unleash a weapon skill so that they are even more useful when fighting alongside you. In the March version update we've added Cherukiki, Zazarg, Nashmeira, and Ingrid. Be sure to check out each one of their unique messages. Read here for details on how to obtain each alter ego. Additionally, during the stream we introduced Ovjang, Mnejing, and Sakura, which can be obtained during a special Alter Ego Extravaganza that will kick off from April 1st. When calling Ovjang and Mnejing while you have Nashmeira out, each of their stats will be boosted. Ovjang will receive reduced enmity and increased magic damage, and Mnejing will receive increased defense and increase enmity. Sakura will not actually participate in battle, but by calling her out she will give you regen and an increased rate for physical combat skill increases. I didn’t mention this during the stream, but we’re making it so the regen effect will scale based on your level. Additionally, we'll be adding a new alter ego in the future that will make it easier to increase your magic combat skills. You'll also be able to obtain Tenzen, Mihli Aliapoh, Valaineral, and Joachim that were available during the New Year's Alter Ego Extravaganza that wrapped up in February, so if you just started playing or just came back to Vana'diel, or perhaps missed it last time, will have a chance to obtain these alter egos. We've added the /hidetrust command to hide other players' alter egos. If you find yourself in a position where there are a lot of players around and too many alter egos out which is making it laggy, please use this command. *The stream shows off Cait Sith in action. We've added Cait Sith as a new avatar. Cait Sith has a unique Blood Pacts known as “Level ? Holy” where you roll a dice and deal damage depending on the number rolled. If you roll a 5, large damage will be dealt to enemies whose level is a multiple of 5 (5, 10, 15, etc. ), and the damage will increase the larger the number you roll. We'll be moving both Mewing Lullaby and Eerie Eye, which are currently categorized under Blood Pact: Rage, to Blood Pact: Ward so that it follows the same categorization of Shiva, Diabolos, and all the other avatars. Also, there is a bug with Cait Sith's perpetuation cost being set higher than intended, so we will be fixing this. After the fix, Cait Sith's perpetuation cost will be lowered to be the same as that of Carbuncle. These adjustments and fixes will take place in the April version update. *During the stream, new equipment that can be obtained with Mweya Plasm by defeating new Delve NMs was introduced. We've introduced new Delve areas in the version update that took place this morning (Friday, March 21st (JST)). *During the stream, the UI for the Job Point system was shown off. Job Points are a new character advancement system that allows you to enhance the traits and abilities of each job. This system differs from the concept of the merit point system which allowed players to arrange the same jobs differently. The concept of Job Points is to enhance the actual capabilities of the job, and it’s possible to max out each category for the jobs you want to enhance. In the March version update the first categories added were mainly special abilities and abilities that are learned at low levels. However, we will continue to add more and more categories moving forward. We’ll also be increasing the cap for each category as well. We’ve been receiving requests to make it so stats can also be enhanced, and we are currently looking into increasing the cap on each merit point category. *During the stream the appearance lock feature was shown off. We've added the /lockstyle command to lock the appearance of characters. By using this feature, you'll be able to freely select which equipment to use while maintaining the appearance of your choice. Additionally, it will make it so your character no longer disappears when switching equipment. At the moment, when changing weapons or areas the appearance lock will be removed and we realize this is a slight inconvenience; however, we have plans to make this a more robust feature in the future. *The revamped fishing system is shown off during the stream. We've made large revamps to the fishing system in the March version update. We've made it so when reeling in a catch the applicable movement key will only need to be pressed once instead of having to press and hold it, and we've reduced the performance gap between the various platforms. Additionally, we've also made on-screen graphical indicators for which direction needs to be pressed to make it easier to understand. Also, fishing skill now largely affects the difficulty when reeling in a catch. If your fishing skill is higher than a lower level fish, it will be easier to reel in with little resistance; however, if you attempt to reel in a higher level fish you'll have to prove how skilled of an angler you are as it will be more difficult. Full details on the fishing revamps can be found here. Additionally, we've added a fishing category to Records of Eminence. The objectives added are mainly tutorials, but moving forward we will be adding objectives that fishing masters can challenge. We've made it so when selling items on the auction house you can check the bidding history of posted items. In a future version update we'll be displaying the number of items posted, the item help text, item category, and other information. We're currently making plans to add an equipment-specific inventory that will allow you to equip gear directly without having to shuffle the gear you want to equip into your main inventory. Additionally, we’re planning to add a new equipment swapping macro that will allow you to swap out multiple pieces of equipment with one macro line.